If you’ve never fulfilled your travel ambition of visiting a Greek island due to your reluctance to take to the open seas, located off the west coast, the Ionian island of Lefkada may be just what you’re looking for (click here for a map). Although the island is a six-hour drive from Athens, it’s possible to take a 45 minute flight from Athens International Airport and then hire a car, something considered essential once you’re there anyway. After crossing the short bridge that connects the mainland to Lefkada, you’re almost immediately amongst an abundance of trees, reenery and mountains. 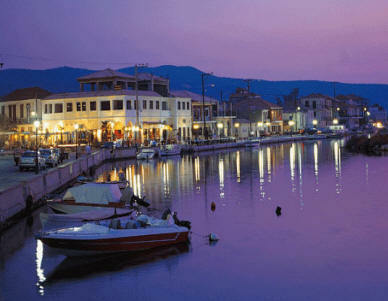 Lefkada retains the traditional Greek island feel. The livelier towns of Nydri and Lefkas have plenty of afés, restaurants, shops and a smattering of nightlife; quieter villages like Vassiliki are less touristy and better for enjoying true Greek cuisine and mingling with the locals. Travel out of town however, and the island will begin to make sense; Lefkada isn’t about busy streets, it’s about beauty. As you explore the twisting roads and climb higher into the mountains, the world seems to open up around you. Wonderful sea views stretch out, the famous island owned by the Onassis family, Scorpios, sits in the bay and olive groves and cotton fields pass you by as you drive. Heading west you’ll come upon Porto Katsiki, one of the most famous (and beautiful) beaches in the Mediterranean. 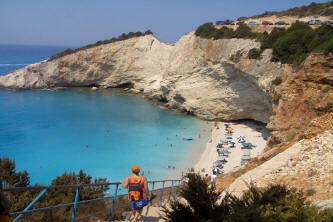 Katsiki, with its towering white cliffs and sublimely clear water is a beachgoer’s paradise. The more adventurous can swim around an outcrop of rocks to find another, more secluded beach for themselves. experience, without having to waste any precious hours on a ferry.